Photos are from the "IRTC, I am a Doughboy" booklet. This booklet was to be sent home to the inductee's family so they could see what the training their boy was going thru. Gentlemen, may I have your attention, please. This afternoon we are going to witness a demonstration of range procedure with the 60mm Mortar. First, I would like to refresh you on the different duties of each member of the 60mm Mortar Squad. Gentlemen, in this squad you have one Corporal (hand raised). 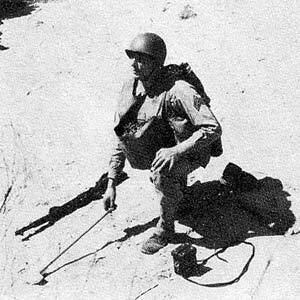 He carries with him, the base plate M4 in the base plate bag, spare parts, the sight M4 which may be used on the 81mm Mortar, field glasses, compass, bore cleaning brush with staff, and ammunition M-1 in bag (weight 25 pounds). Next we have the Gunner (raise hand) who is the #1 man in the squad. He carries the Mortar, bipod attached, and the aiming stakes. The #2 man (hand raised) is the Asst. Gunner and carries one ammunition bag M2 with twelve (12) rounds of ammunition. 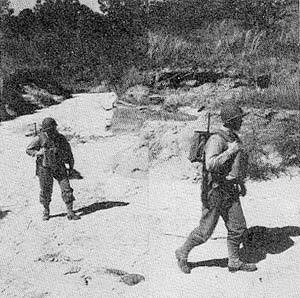 The #3 and #4 man (hands raised) are ammunition carriers and they carry twelve (12) rounds of ammunition each..
Gentlemen, at any preparatory command of the squad leader, all members of the squad automatically secure equipment. 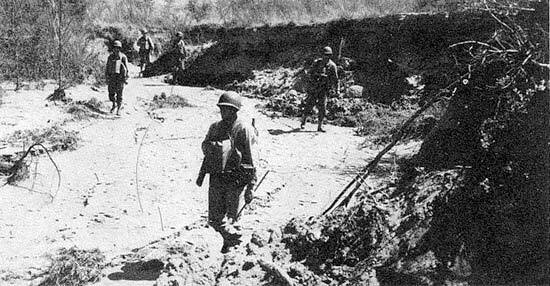 Any time that the squad leader commands or signals, "Halt" all members of the squad except himself, automatically ground equipment without command. To put the Mortar into action the squad leader commands "Action!" At this time he moves forward and drops the base plate, where the mortar is to be mounted. He then moves forward and places the sight M4 at the Primary firing position. At the same time the Gunner #1 man is mounting the mortar where the Corporal dropped the base plate. As soon as the mortar has been mounted the Gunner moves up (one man load) where the sight has been placed by the Corporal. Then he removes the sight from the leather carrying case and places it in the dove-tailed slot on the mortar. At the same time the #2 man, the Asst. 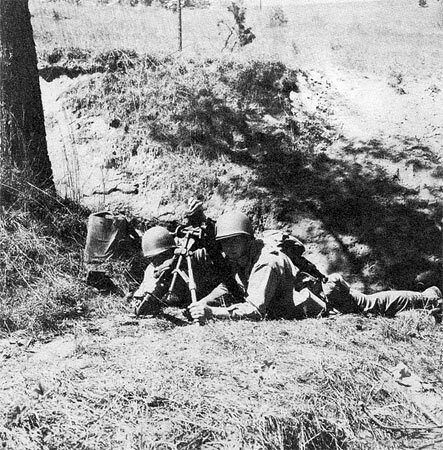 Gunner, has moved out to place the base stakes on the line mortar-target under the direction of the Corporal. Meanwhile the Gunner is laying his mortar. He does this by getting his base plate and legs settled as much as possible, then by turning his traversing handwheel approximately seven (7) turns he centers the traversing mechanism and by turning the elevating crank approximately fifteen (15) turns up he centers the elevating mechanism. The gunner then turns the elevation micrometer knob to sixty-five degrees (65°), the deflection micrometer knob to zero (0). The gunner then aligns the white line in the collimator and black line in the open sight on the left edge of the base stake, and getting the cross level bubble (point) level, and the longitudinal level bubble (point) level, by moving the legs of the mortar forward, back, right or left. When he has done this the mortar is said to be laid. #3 and #4 are echeloned to the right and left rear in the prone position. Gentlemen, I would like to invite your attention to the fact that each member of the Mortar Squad must know each other member's job. They rotate on the Corporal's command of "Fall Out, One - two - or four" whichever it might be. (Execute). To take the mortar out of action it is the reverse of putting the mortar into action except that the Corporal no longer carries the base plate. The mortar (base plate attached) is a one man load now and is carried by the Gunner. When the Corporal commands ("Out of Action") (Execute) - the gunner removes the sight and places it in the leather carrying case. He then lowers his elevating crank and moves his traversing mechanism to the right and secures the legs together with the leather strap. At the same time the #2 man moves out to secure the base stake. Now the mortar squad is ready to move out and the Corporal signals "Forward". 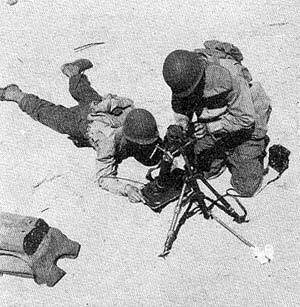 The next time the mortar is put into action the Corporal does not have the base plate to drop, so he merely places the sight at the primary firing position. Gentlemen, are there any questions? (Mortar put into action in normal sequence. Slow motion, dry run and explain the Bracketing method while the demonstration squad execute). Gentlemen, there is one rule in the Bracketing method that I would like to bring to your attention. For ranges less than one thousand (1000) yards, use a one hundred (100) yard bracket. For ranges greater than a thousand (1000) yards use a two hundred (200) yard bracket. The Bracketing method is merely getting a round over the target and a round short of the target. Then gradually decrease or increase your range until you are on the target. (Example). If your initial range was (700) seven hundred yards and the round hit short of the target, in your subsequent fire order the range would be (800) eight hundred yards. If the next round hit over you would decrease your range to (750) seven hundred and fifty yards. If you were still off the target and the last round hit over, your next range would be (725) seven hundred and twenty- five yards. But if your fire had hit short of the target, your next range would be (775) seven hundred and seventy-five yards. A (25) twenty-five yard bracket is small enough to take care of any point target. Normally, searching, traversing, sweeping and area targets are handled by the 81mm, The 60mm Mortar is used for point targets only. Of course, there are exceptions to all rules, But today we are going to demonstrate firing at point targets using the Bracketing and Creeping method. Gentlemen, the 60mm Mortar is a very effective weapon. It is a weapon of opportunity and must be kept well forward to get the maximum benefit of this weapon. You must have observation; as long as you do have observation the three mortars in a rifle company are kept together. When you no longer have observation, they are assigned individual tasks or attached to the rifle platoons of the company. (Demonstration of Initial and Subsequent fire orders using Bracketing method. Demonstration squad executing while I explain. Also this is a dry run). Gentlemen, there are four points in an initial fire order that you must remember. They are " Range, Deflection, Aiming Point and Number of rounds. Now sensing is merely being able to tell if your fire is hitting over your target, short, left, right or if you yourself are doubtful. (Caution that the bore must be swabbed every 10 rounds). Initial Fire Order. 800 Zero Base Stake. One Round. (Remove sight for first three rounds). Subsequent Fire Order - 900 Left 30 One Round. This round was short so his range must be 900 in order to establish his bracket. The last round was to the right so he read on his mil scale in his field glasses and determined that the fire hit 30 mils to the right of the target. Naturally his deflection would be left three zero in order to get the fire in the same line mortar target. Again he "only used one round, in order to conserve ammunition, prevent wild shooting and establish his bracket. Subsequent Fire Order - 850 Right 10 One Round. Since the round was over he would naturally cut his hundred yard bracket in half. So his range would be eight five zero. The fire hit to the left of the target; reading through his field glasses he saw that the fire hit to the left of the target (10) ten mils. Therefore hs would have to come right one zero to get on the line mortar target. Completion of Fire Adjustment. 875 0 One Round. He placed fire on the target that time so his next fire order would be: Fire For Effect 5 Rounds. In subsequent fire orders, the number of rounds is always announced as this element is the Gunners command of execution. When you are firing close to friendly troops the bracketing method cannot be used. So we use what is known as the creeping method. First you estimate the range to the target, then you add a (100) one hundred yards for safety. The observer estimates the distance of the burst from the target and deducts one half of this error in range from the previous range setting for the next round. (Example) The range to the target is 700 yards, and the first round fired has a range of (800) eight hundred yards (using the safety rule). If the estimated range was correct the burst was a hundred (100) yards over. The second round would then be fired using a range of (750) seven hundred and fifty yards. The next round (725) seven hundred and twenty five yards etc., until fire was placed on the target. The same procedure as in the bracketing method except, you add a (100) one hundred yards for safety to the estimated range and creep back to the target. DO NOT CREEP UP TO THE TARGET. (Conference and demonstration at same time as in bracketing method). Example of Creeping Method. 700 yards known range. 800 for safety. Initial Fire Order - 800 Zero Base Stake One Round (Explanation). Subsequent Fire Order - 750 Left 20 One Round. All right, gentlemen, we have a miss fire. What do we do. The first thing that the mortar crew does is to wait (1) one minute and do nothing. Gentlemen, you wait a minute before removing a miss fire in order to avoid an accident that may be caused by a delayed fire , Then the Gunner removes the sight and places it in the leather carrying case. He then strikes the tube with a non-metallic instrument. If nothing happens, he removes the mortar from the base plate by unlocking the locking lever. 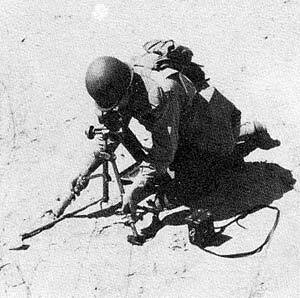 The Gunner then reaches out and around the bipod and grasps the right leg beneath the hand grip, and raises the mortar with his right hand grasping the base cap, very slowly and gently. At the same time the Assistant Gunner has his right hand underneath the tube palm up and his left hand on top of the mortar tube palm down ready to stop the shell as it approaches the entrance. He stops the shell with both thumbs, lifts the shell out and places the safety pin back in the shell and passes it to the #3 man. He in turn inspects the shell, trying to determine the cause for the miss fire. (1) Defective primer or ignition cartridge. (2) Bent or crooked cartridge container. (3) Defective, damaged or loose firing pin. (4) Firing pin fouled or obstructed by fragments from previous rounds. (6) Too much oil in bore. (7) Cartridge not fully inserted in container. Subsequent Fire Order - 725 Left 10 One Round. Fire for Effect, Five Rounds. That is all, gentlemen. Thank you very much.